Lamb dressed as Mutton: Parents and cake! 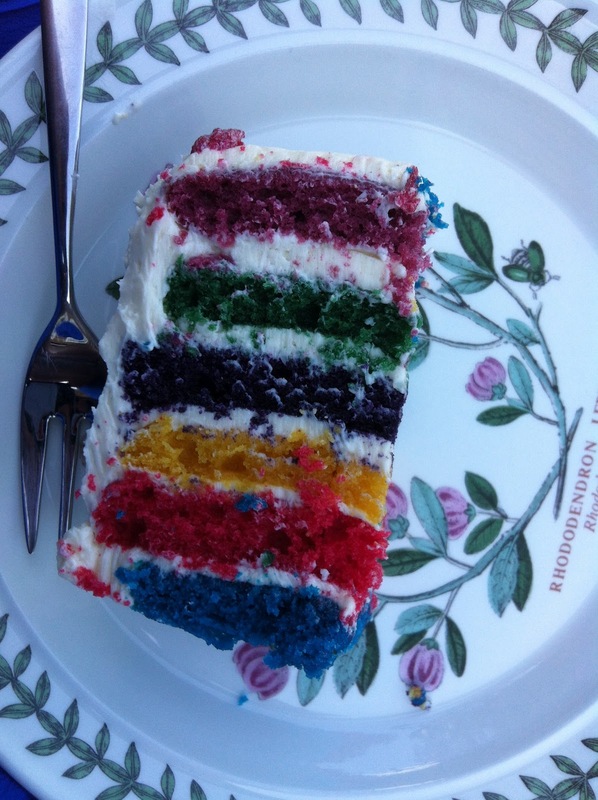 When I say parents, I mean the television programme starring Sally Phillips and Tom Conti and when I say cake I mean an absolutely amazing rainbow cake. Are we clear? Great! So. Parent's. It is a new comedy on Sky 1, about (you guessed it) Parents! Sally Phillips' character looses her job and is forced to move her husband and two children back to her parents house. The first episode aired last Friday and although it wasn't the best programme around, I think within time I will grow to love it. Sally Phillips is great in the role. If you don't know her, she is most well known for playing Shazza in Bridget Jones' Diary 1 & 2, or from playing Tilly in Miranda, but I know her from playing Tash in Jam and Jerusalem, the superb comedy from Jennifer Saunders (if you haven't seen it, it is really good, a nice gentle comedy with an amazing cast). Anyway enough about that. The next episode is on Sky 1 this Friday at I think 8.30, so tune in and let me know what you think! 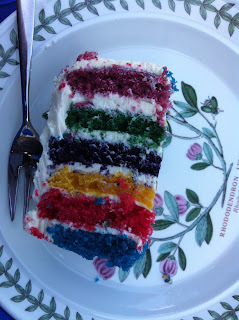 Right, now let us move onto cake. The other day it was one of my friends twentieth birthday's and I decided that I would make her a cake. 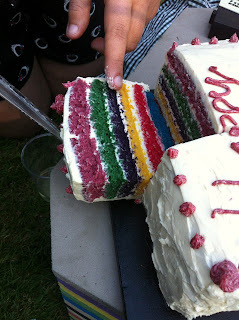 I saw the cake on Teenage Granny's blog and I knew that I had to make it, and it would be perfect for my friend. I'm not going to lie to you, it took me a day and a half to make it, and I was one of the most stressful cake's I have EVER made, but when she cut into it, I didn't care. If you have the time and the patience I would definitely recommend that you make it, but beware the icing almost tipped me over the edge (it took four attempts, use butter not margarine). But here is it. Not only did it look awesome, it tasted great too. Someone who tried it said that "that cake was lighter than f**king air"! Not a bad review really! Hope you enjoyed Wimbledon, I certainly did. Let me know what you think of Parents on Friday.